Among the more than 1,000 restaurants in Wichita, we love these sandwich shops that are family owned and operated. Enjoy one of their sandwich offerings in the restaurant or get it to-go and enjoy the tasty meal at one of our parks. All have vegetarian options and can accommodate other dietary restrictions. You’re going to love the smell of the fresh, baked-from-scratch focaccia bread when you walk into this small deli located just east of downtown. It’s off the beaten path but worth discovering. Bocco’s chef/owner takes pride is handcrafting gourmet sandwiches with love. Diners have called the BLT the best in the city and have claimed the Chicken Bacon Club (grilled chicken, sweet pepper bacon, baby Swiss, cheddar, spicy honey mustard, mayo, fresh tomato and lettuce on focaccia) is life-altering. This downtown, fair trade coffeehouse serves up more than a locally roasted cup of coffee: they have a menu of affordable wraps and panini sandwiches available for lunch. The paninis are built on local Delano Bakery rustic bread. Among the options, the Bobby Boy includes roast beef, cheddar, onion and cucumber ranch. The Mrs. V has mushrooms, spinach, tomato, pepperjack cheese and hummus. 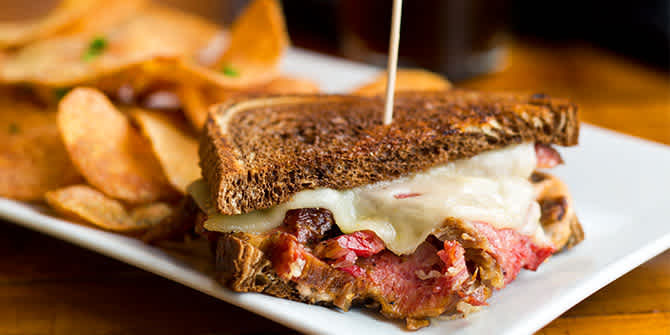 Located at the roundabout in the historic Delano District, Monarch’s menu is dominated by sandwiches. All of their meats are smoked in-house daily and crafted into creative selections. You won’t find an ordinary club here, but you can order the Beyond Downtown Club, with smoked turkey and ham layered with duck bacon, lettuce, tomato, cheddar and Swiss cheeses served on toasted bread. Good luck choosing between the sweet potato tots or the homemade potato chips for your side. Families have been coming downtown to Old Mill Tasty Shop since 1932 for a soda or ice cream made from the working soda fountain as well as tasty sandwiches. The New York chicken salad is a favorite, made with chicken breast, celery, onion and cashews, served on egg bread with baby Swiss cheese. You’ll find other traditional favorites alongside a few unusual options, such as a liverwurst sandwich or the peanut butter, banana and honey sandwich. Save room for a chocolate malt made the old fashioned way! Mostly known for its New York style thin crust slices baked in a brick oven, Picasso’s Pizzeria in the Delano District also has a loyal following devoted to the pizzeria’s sandwiches. They have about a half-dozen sandwiches, including The Guido, made with capicola-style ham, pepperoni, salami, provolone, Roma tomato, red onion, greens and served with a side of creamy Italian dressing. Tanya’s Soup Kitchen is a quick-service restaurant in the Douglas Design District with a menu of sandwiches, salads and small batch soups that change daily and rotate seasonally based on availability of local ingredients. A few of their creative sandwiches: Lulu has edamame and roasted garlic hummus with spinach, roasted peppers, toasted almonds and avocado on wheat toast, Cindy the Boy has ham, Swiss cheese and apple chutney on ciabatta and Blue Key North has smoked turkey, blueberry barbecue sauce and provolone on an onion kaiser roll. In the heart of downtown, The Artichoke is a sandwich restaurant by day and a bar by night. They have a celebrated menu of sandwiches, including what they call the Famous #8, “the most popular sandwich in Wichita!” It’s made with turkey, bacon, Swiss & cream cheeses, lettuce and tomato, grilled on an onion hoagie and topped with Italian dressing and Parmesan. The Kitchen is located downtown at Union Station in the historic Baggage Claim Building. Their menu is built around fresh, made-from-scratch food served in a casual relaxed atmosphere. Their sandwich offerings are pressed panini sandwiches made with all-natural meats, cheeses and vegetables. Choose from seven options, including a French press panini, a Cuban and a triple grilled cheese.